For local medical cannabis patients, cultivators, collectives, and their advocates—and the local jurisdictions tasked with drafting policies to regulate them—it’s going to be a busy couple of months. Currently, all five cities in San Luis Obispo County and the county itself are drafting ordinances to control or ban the cultivation of medical marijuana in order to meet a March 1 deadline set by state laws passed earlier this year. Those ordinances are being considered and voted on at public hearings throughout the county in December and January. UNDER PRESSURE: SLO County and its cities are racing to develop and pass medical marijuana cultivation ordinances in the face of new state legislation. The Medical Marijuana Regulation and Safety Act (MMRSA) will require state licenses for all aspects of the industry, including cultivation, testing, manufacturing, distribution, deliveries, and retail. In order to get a license, applicants must first demonstrate that they are compliant with local laws by obtaining a permit, business license, or other appropriate form of authorization. 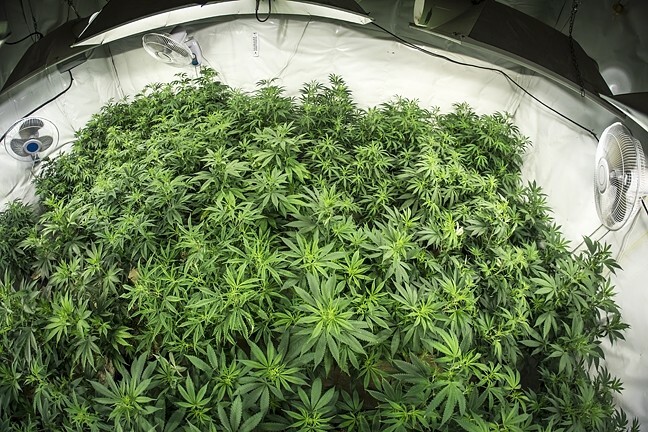 For cultivation, localities must have regulations in place by March 1, or they’ll cede oversight to the state. That deadline was a mistake, however, according to the bill’s author, who’s supposed to introduce clean-up legislation to strike the deadline in January. While some localities are aware of the “mistake,” they’re still proceeding—albeit cautiously—so ordinances are in motion or on the books in case the March 1 deadline stays. Because ordinances don’t take effect until 30 days after being passed, decisions must be made prior to Feb. 1 in order to meet the deadline. The general trend among the county’s cities is to consider some sort of ban on cultivation by the deadline, while SLO County will be considering an ordinance to regulate the cultivation of medical cannabis. All ordinances can be revisited and amended in the future. The MMRSA regulations exclude personal grows that do not exceed 100 square-feet and caregiver grows that do no exceed 500 square-feet and provide for up to five medical cannabis patients. However, the laws give local jurisdictions the option of banning or regulating the smaller, personal grows. On Dec. 1, the Arroyo Grande Planning Commission voted to recommend a ban on all cultivation, including personal grows. That City Council will consider that in January. On Dec. 15, the county Board of Supervisors, the city of SLO, the Pismo Beach City Council, and the Atascadero Planning Commission each considered their respective options. The San Luis Obispo City Council reasserted what is effectively a de facto ban on medical marijuana cultivation within the city at its Dec. 15 meeting. The city operates under a permissive zoning code that gives an extensive list of what land uses are permitted and where. Whatever use is not included in that zoning scheme is effectively not allowed. For that reason, the city will not permit brick-and-mortar medical cannabis dispensaries, nor will it issue business licenses to mobile delivery services. In addition, the city will not issue permits for commercial medical marijuana cultivation. Several members of the public commented on the legal ambiguity created by the fact that while the city may not actively pursue medical cannabis operations, they are explicitly illegal. “For the last 20 years there has been a lot of limbo and legal gray areas that we’re operating in, and we’re not really sure what we’re allowed to do and what we’re not allowed to do,” said Dan Shinn, a SLO resident and owner of Top Shelf Produce and Garden Supply. Several people who said they use or provide medical cannabis expressed concerns that the city’s refusal to permit the industry will lead to restricted access of medicinal cannabis. Under the city’s current zoning code, no one operating a medical marijuana business in the city of SLO will be eligible for a state license come 2018. In addition, personal grows are not explicitly permitted, though City Attorney Christine Dietrick didn’t think it would be an issue as long as cultivation doesn’t violate the city’s offensive odor ordinance. Councilmember Dan Rivoire encouraged his colleagues to begin considering an ordinance that would regulate medical cannabis activities in the future, which would therefore allow for state licensing. The Atascadero Planning Commission voted 7-0 to recommend that the City Council repeal an existing marijuana ordinance code and adopt a nearly identical zoning code prohibiting medical marijuana dispensaries, cultivation facilities, commercial cannabis activities, and medical marijuana deliveries. If the City Council approves the code, it would prohibit all forms of medical marijuana cultivation, including patients growing for personal use. Commissioners Charles Bourbeau and Dennis Schmidt raised concerns about the degree to which the ban on cultivation and deliveries would affect those who depend on medical marijuana. “My biggest concern here is how can citizens of Atascadero legally obtain it?” Bourbeau said. Schmidt wasn’t thrilled about the 100-page-long staff report, which consisted of articles connecting medical marijuana activities with crime. Commission Chair Mark Dariz countered that the crime activity that’s supposedly linked with medical marijuana operations presented legitimate risks to the community. While the commissioners lamented the hasty and haphazard circumstances, ultimately retaining local control of the medical marijuana subject trumped all else. “We are under the gun to make a decision,” Dariz said. The Atascadero City Council will convene on Jan. 12 for a final decision. The Pismo Beach City Council directed its staff and legal council to develop a total ban on cultivation within the city at a Dec. 15 meeting. The ban would not only include commercial cultivation, but also marijuana grown by medical marijuana patients for personal use. There was some discussion of crafting a more permissive ordinance that would allow patients to keep or grow one or two plants, but Pismo Beach Police Chief Jake Miller said that could be difficult to carry out. During the public comment, some residents urged the council to reconsider the ban, including Kate Kytle, who said she used cannabis oil while she was treated for a very aggressive form of breast cancer. Mayor Shelly Higginbotham supported the cultivation ban, but hinted that the council could take another look the ordinance in the future after complying with the March 1 date to retain local control. Pismo Beach already has an ordinance that bans brick-and-mortar medical marijuana dispensaries. There is no ban on mobile delivery services, and a cultivation ban would not affect those services, said City Attorney Dave Fleishman. “At the current time there is an effective method for patients to attain medical marijuana,” Fleishman said, referencing the delivery services. Fleishman said the ban, which has not been drafted, would treat violations as administrative instead of criminal and likely entail a fine. A draft of the ordinance will be presented to the council in early January. The county Board of Supervisors decided unanimously to consider an urgency ordinance that will create regulations for medical marijuana cultivation in the unincorporated areas of the county, rather than pursue a ban on cultivation. Under the recommendation of County Administrative Officer Dan Buckshi, the urgency ordinance approach will give the county a little bit more time to review potential regulations because it does not require the typical 30-day period before going into effect. This way, the Planning Commission will have a chance to make recommendations, and the supervisors will have until the end of February to make a decision. An urgency ordinance requires at least four out of five votes. “The purpose of pursuing that would be to allow us to retain local control and allow us to consider more permanent options down the road,” Buckshi told the board. During the meeting’s public comment period, more than two dozen people spoke, and all but one person urged the county to allow the cultivation of medical marijuana. Joy Fitzhugh, legislative analyst of the San Luis Obispo County Farm Bureau, said that the Farm Bureau does not yet have a position on the issue, but requested that they be included in the process because the ordinance could have significant ramifications for the agricultural industry. Several speakers spoke to the importance of keeping production local. “A lot of people are really responsible about the way that they grow around here,” said Ernest Hall, owner of the mobile delivery service Dub’s Green Garden. Hall added that he prefers to buy medical cannabis from local producers so he can better monitor the quality. “We’re going to get it either from our own community, or outside of our community and I’d rather keep the money inside our community and take care of our own people … ,” he said. The supervisors agreed to proceed with considering options to regulate cultivation and to use an ordinance from Mendocino County as a model.